This is the book I have been waiting to read for a long, long time, like many fans out there. I tried to read it slowly, but I still finished it in under five days. I will not give away too much. There are many other good reviews out there, as well. I will say that I highly enjoyed it. And, of course, Louis is in this book. It wouldn’t have been right if Louis and all of the others were not in this book. I could probably be more critical, but I really do not wish to be at this time. I love this book because I loved the earlier books twenty plus years ago. I have not loved some of the other books Ms. Rice has published in the meantime. I liked them, but it was Louis and then Lestat that I loved most as an older teen. I loved this book because many questions there for years were answered. “Interview With The Vampire”, the movie, came out in theaters twenty years ago this month. I did see it in the theater, as well. Okay. . . This is the seventh book in the Betsy Taylor series. I did not enjoy this book nearly as much as several of the previous books of the series. Perhaps it is because a few of the characters died and because it just was not as humorous! Where was the funny quirkiness I’ve come to expect from the author? I just didn’t feel it this time. In previous books, the humor comes from ridiculous situations such as finding out that her newly discovered half-sister, Laura, who teaches Sunday School is actually the daughter of Satan, an extremely good daughter of Satan. In this newest installment of the series, I wanted to ask the figurative question: Where’s the beef? The Fiends are loose. Their minds are returning and they are remembereing who the are. So . . . they want to kill Betsy, because she’s the vampire queen. It’s not her fault they were made into vampires, and made to become feral, dumb creatures. The entire book was boring, with the exception of The Ant (her now-deceased young stepmother, whose body was taken over years earlier by Satan, gave birth to Laura, who was then given up for adoption) coming back to haunt Betsy. This is really the only fun part, to me, of this book. Ms. Wright was a very kind and gracious woman. I felt more shy than usual in her presence. She was an Author! I couldn’t believe that Authors were really very real people. It was quite intimidating for me, but she was very nice (which made me think all Author as nice people, which didn’t seem to be the case the next year when I met a different Author – a YA writer – who seemed very put out – but that will be another entry in the future). After meeting her, and reading Dollhouse Murders, I proceeded to borrow the rest of her juvenile/pre-teen books from the library, and to read her new books as the came out even as I got older. I loved her style. Amy finds an old dollhouse in the attic of her aunt’s house. It looks completely like her aunt’s house, too, inside and outside. 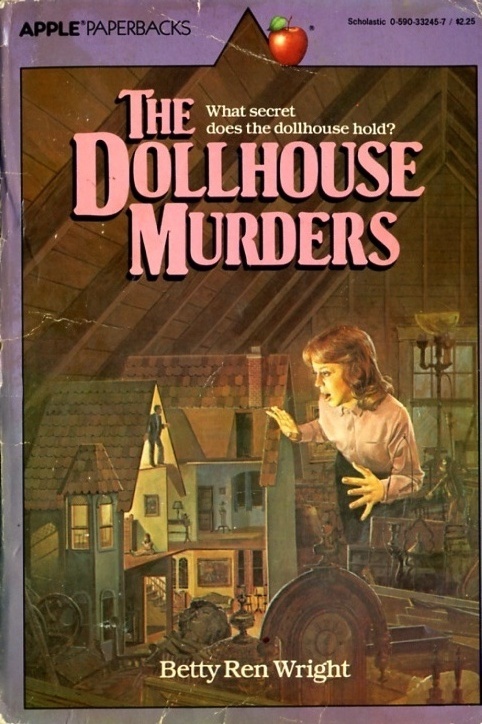 Lots of strange thing happen, such as the dolls moving on their own (and this gave me a taste for creepy doll stories – in high school I moved on to Ruby Jean Jensen horror paperbacks, particularly her book Baby Doll.) The back cover blurb says, “Amy knows the dolls are trying to tell her something – but she’s terrified to find out what.” I had to read to find out what, of course. The books begins with Amy with her best friend Ellen, and they are out in public trying to look for Louann, Amy’s younger sister who is larger than she is but Amy has to take care of because she is mentally retarded. She resents having to take care of her all the time (which some things later in this book resolve – things with their mother, mostly), and runs away to her aunt’s house. Her aunt is great, and offers to let her stay there a little while, to get away, even offers to host Amy and Ellen’s joint sleepover birthday party. However, her aunt gets angry and upset when she finds that the dollhouse (which was hers when she was younger) has been played with, and the dolls, who represent her aunt’s murdered grandparents, are in the positions they were in when they (the grandparents) died. She does not believe Amy when Amy says that she is not the one moving the dolls. It is finally when Louann witnesses it and corroborates the story that Aunt Clare finally believes. They figure out that the dolls/the grandma’s spirit is trying to show them where to find the answers to what happened all those years ago. The grandma doll leads them to the house’s library room – and a letter is found in a book. It turned out that Aunt Clare thought that she was responsible for the death of her grandparents – that her boyfriend at the time killed them. It turned out it wasn’t him at all. Aunt Clare starts looking very young again, and stops beating herself up over it. It was a very satisfying read. I had already liked ghost stories, but this book I would recommend easily to 8 to 12 year olds. I really, really liked the author, too, as a person. It is important for kids and teens to actually meet the author. It’s magical . . .